The wife and child were out of town a few weekends ago, and I had a bit of time to myself. It used to be that such time was converted into 99% hobby time, but alas and alack, I spent most of the time doing various chores that had accumulated. I did have some time to try out a figure conversion that I first dreamed up a while back. I had been looking around for power armor to accompany the lovely Copplestone Neo-Soviets (comparison picture here). They are largish 28mm figures, and I wanted something that looked a bit like the MAK designs. 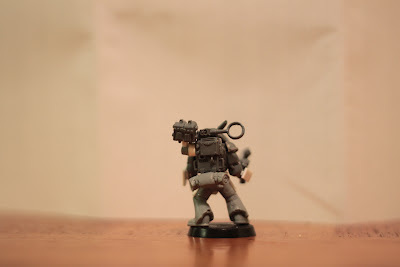 I somehow hit on the idea of kit bashing Space Marine legs and a Tau Stealth Suit torso, and over the next few months, collected the various bitz I needed. Then they sat in a box for a few years like most projects of mine. Parts from seven different GW kits. What do you think? Does it work? 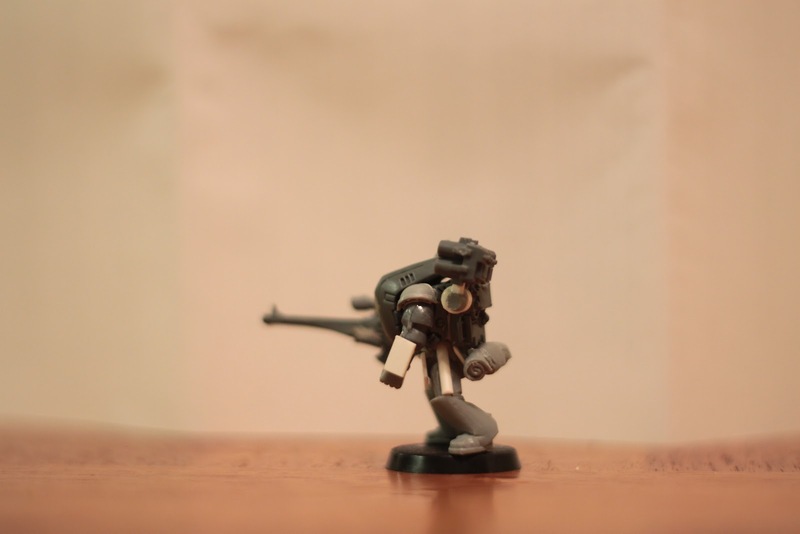 Red Box Games, Tré Manor's line of miniatures, is having a kickstarter to transition the HelsVakt Gynnade Krigare figures from metal to Trollforged plastic-resin. Backing at $25 (Plus shipping?) means that you get five figures, when normally they go for $40 in metal. So a good deal if you are looking for properly scaled chaos warrior types. Tré is a great sculptor, and used to (still does?) 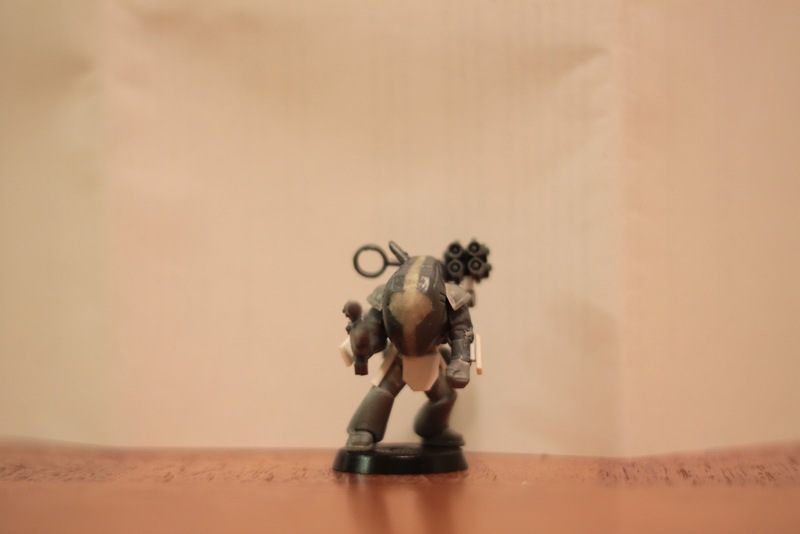 produced the odd figure for Reaper as well. His figures have a great musculature, and always seem to be loaded down with gear the way real people would be in battle, or better, when exploring a dungeon. The current Red Box line has some great figures, so I am watching this one eagerly, and hope that it allows Tré to re-release a number of his lines into cheaper plastic-resin. So please give eagerly! Rolang, of Rolang's Creeping Doom, has been posting some great stuff lately in regards to Clerics. One of the most interesting is a form to help you figure out, or record, the details of a particular faith in your setting. If you are building a more structured, or at least non-gonzo world, inevitably you are likely to have a major religion, which has a structure, dictates, temporal power, and clergy (which may be where the clerics of your world come into the picture). While many probably just run with a fantasy version of the Roman Catholic church circa 1200 with minor gods subbing in for saints, or possibly a Greco-Roman style pantheon, occasionally you want something more complicated, either for the RP purposes presented, or because it fits your setting better. Offerings: Burnt livestock portions, money. The Shepard is not depicted in person, but sometimes is seen as a cloud, or as a man seen from behind with a flock. Orthodox oath: I will to my Lord and Master the Shepard, be faithful in all things, love all which he loves and shun all which he shuns, according to His laws and the order of the world. Nor will I ever with will or action, through word or deed, do anything which is unpleasing to him, as He will hold to me as I shall deserve it. Astounding at all levels, but diffusely spread amongst the various dioceses. Tithing is a set 10% of income. Popularity: Popular where ever humanity is found. Particularly strong in Brémdy and Chénez (19), and large basilicas are found there. Less popular in Turq lands (5). Empty pastures, and churches, various sites related to saints. Potential Afterlife(s): The endless field, where humanity flocks together under his guidance. This looks like it could be useful, however, I wonder if it would make sense to use some of the ideas from Stars Without Number factions for the organization of the church itself, i.e. Hit Points, Force Rating, Cunning Rating, Wealth Rating, and FactionCreds, as well as Assets (armies, agents, and influence), and Tags (Machiavellian, secretive, plutocratic etc.) . Working with the SWN system in a fantasy setting should help to figure out how the organization interacts with other political players, and for a major world spanning faith, could be set up for functional sub-divisions, such as the church in a certain country, or a synod. Anyway, food for thought, and certainly a useful tool. Basically, monsters or hazards out in the open are listed in the obvious category, and those which are hidden are either in the detail or DM section depending on how easily they could be found. 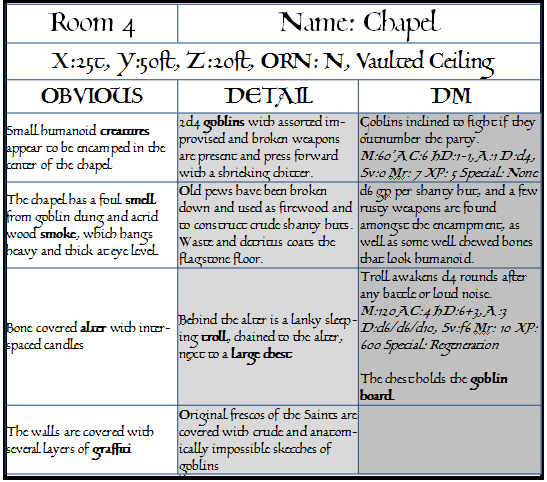 The goblins are obvious to a party opening the door to the chapel, where as the obvious detail of the bone covered alter obscures the sleeping troll until it is either looked at in more detail, or the troll wakes up following a battle or other loud noise.